St. Alban's new processional banner, pole and base are now complete and on display in the church. Special thanks to Dottie for sewing the banner. Fr. Whit sketched the design for the banner and built the pole and base. The banner was created for use in the procession for the consecration of Jake Owensby as the IV Bishop of Western Louisiana. It will be carried by two members of St. Alban's. We will bless the completed banner prior to its use on Sunday, July 1, 2012 and after the consecration it will be on regular display in the church. 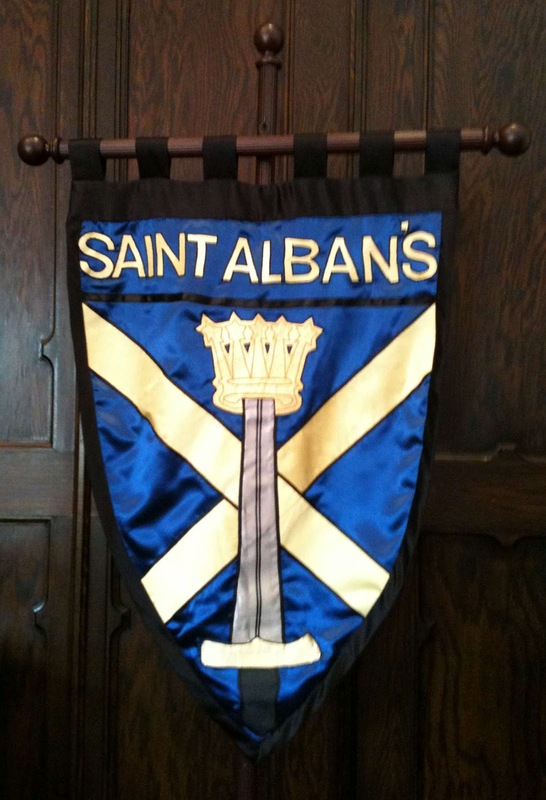 The blue field with golden yellow cross along with the sword and crown is the official crest of St. Alban's Diocese in England, which is the home of St. Alban's Cathedral. The cathedral is located on the site where Alban was martyred.